One of America’s native wild canines, the red wolf, has teetered on the brink of extinction for decades. And despite the efforts of a captive breeding program started in the 1970s, only about 40 such wolves are known to be still living in the wild today, all in North Carolina. But researchers at Princeton University have made a strange discovery that might spell good news for the future of the species: A population of wild dogs, isolated off the coast of Texas, that seem to carry red wolf genes, including remnants of DNA thought to be lost forever. The researchers’ discovery wasn’t intentional, according to a press release from Princeton University detailing their subsequent study, which was published this month in the journal Genes. Ron Wooten, a wildlife biologist living in Galveston, Texas, had started tracking a population of wild dogs on the nearby Galveston Island. From afar, the Galveston dogs didn’t quite look like the coyotes native to the area. And people have claimed to have seen red wolves in the Gulf Coast area, decades after they were declared extinct in the U.S. in 1980. Wooten wanted to get a second opinion, so he got in touch with Bridgett vonHoldt, an ecologist and evolutionary biologist who runs the North American Canine Ancestry Project at Princeton University. Her lab tested two samples from Wooten, both taken from dogs that sadly became roadkill. And when they compared the genetics of these dogs to DNA samples from a variety of known wild dog species in the U.S., including coyotes, grey wolves, and captive red wolves, they found that the Galveston dogs had some genes only known to belong to red wolves. The Galveston dogs might be particularly important to the continued survival and diversity of the red wolf. In the 1970s and 1980s, hundreds of wild dogs thought to be surviving red wolves along the Gulf Coast were captured and used to start a breeding program. By the time the effort ended, though, scientists had only turned up 40 genetically distinct red wolves, with 14 wolves going on to reproduce. These few wolves now represent the founding lineage of wild dogs recognized as red wolves in existence today, including those that are being kept in captivity and those that were reintroduced into the wild. The reintroduction program of the red wolf in North Carolina—the first attempt to bring back an extinct species in the U.S.—was at first a success, with over a hundred wild red wolves estimated to be living in the state as recently as 2006. Now, thanks to hunting, further human encroachment, and a resistance by state agencies and landowners to continue the program, their population has again dwindled to less than 40 known wolves in the wild. The Galveston dogs not only share some genes with the captive red wolf population, but also seem to have genes not present in any wild dog population. Rather, they likely have genetic variations, or alleles, that were commonly seen in red wolves, but not in the small group of captured wolves used to rescue the species from extinction. Unlike many animals, different populations of canines that we classify as species can interbreed with one another and create fertile hybrids. It’s well known, for instance, that coyotes and wolves interbreed (though they prefer to stick to their own “kind”), and that this interbreeding is one of the factors that’s contributing to the wolf’s decline as an unique species. But the Galveston dogs and their ghost alleles, perhaps because they were so isolated, “could represent a reservoir of previously lost red wolf ancestry,” the authors said. And they might be not the only ones. Heppenheimer’s team also found red wolf DNA in at least two samples taken from coyotes along the Louisiana Gulf Coast. These wild dogs obviously aren’t “pure” red wolves, but careful breeding efforts with these populations could be used to restore lost aspects of the species’ genetic history and keep them healthy (inbreeding, as many a pug or bulldog owner knows well, raises the risk of serious hereditary problems). 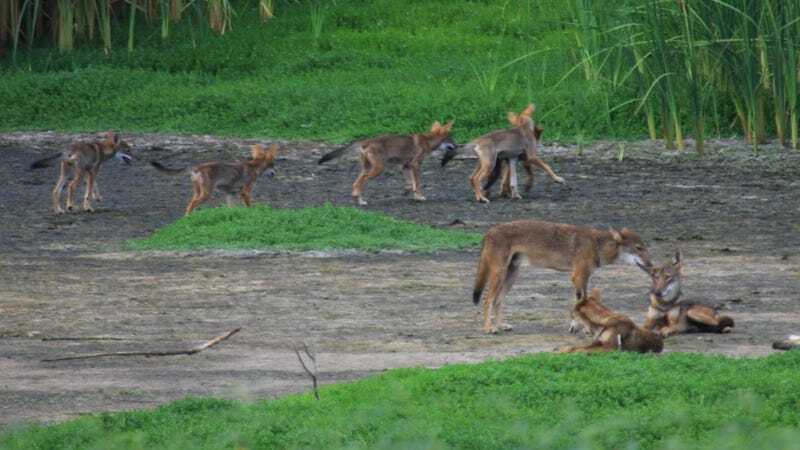 The fact these dogs have survived for so long on the island might also mean that the location or Texas in general could be an ideal spot to reintroduce red wolves in the future. “This unprecedented discovery opens new avenues for innovative conservation efforts, including the reintroduction of red wolf ghost alleles to the current captive and experimental populations,” the authors wrote. Heppenheimer told Gizmodo via email that the team has no immediate plans to return to the Galveston dogs. But as part of their North American Canine Ancestry Project, they do plan to explore how often and to what extent red wolf DNA can be found in possibly hybrid coyote populations elsewhere.